Five field experiments were performed in commercial orchards located in Lleida (Spain) over three growing seasons, 2000–2002, in order to estimate the relationship between the incidence of latent infection caused by Monilinia spp. in peaches and the incidence of post-harvest brown rot. No latent infection was recorded at popcorn and the maximum incidence occurred pre-harvest; in some orchards a second peak was detected during the pit hardening period. Monilinia laxa is the most prevalent species isolated from peaches with brown rot. There was a positive correlation between the incidence of latent infection and that of post-harvest brown rot. The average incidence of latent infection during the crop season explained 55% of the total variation in the incidence of post-harvest brown rot. The effect of temperature (T) and duration of wetness (W) on the incidence of latent infection in peach and nectarine orchards was analysed using multiple regression. The regression analysis indicated that T and W jointly explained 83% of the total variation in the incidence of latent infection. The model predicts no latent infections when T < 8°C, and >22 h wetness are required when T = 8°C but only 5 h at 25°C are necessary for latent infection to occur. The incidence of brown rot and latent infection of peaches caused by M. laxa under controlled experimental conditions were also affected by T and W, as well as by fruit maturity and inoculum concentration. Latent infections were produced in fruit when T was not suitable for the development of brown rot symptoms. 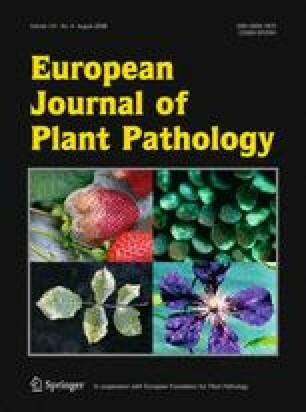 In these experiments more than 4–5 h of daily wetness were required after embryo growth in fruit sprayed to run-off with an inoculum concentration higher than 104 conidia ml−1 of M. laxa for brown rot and latent infections to develop. The fitted model obtained from the field data was able to predict the observed data obtained under controlled environmental conditions. We thank Drs. C. Redondo, J. Segarra, and J.L. Alonso for their helpful discussion and critical reading of the manuscript. This study was supported by grants AGL2002-4396-CO2 and RTA2005-00077-CO2 from the Ministry of Science and Education (Spain). I. Gell received a scholarship from INIA (Spain). We thank Y. Herranz, A. Barrionuevo, and M.T. Clemente for their technical support, and the growers for their support and collaboration. EPPO. (2007). List of A2 pests regulated as quarantine pests in the EPPO region. OEPP/EPPO from http://www.eppo.org/QUARANTINE/listA2.htm.